Twitter and Facebook are the darlings of the social networking world. Twitter, as a microblog, allows you to post only short messages. Facebook allows lengthy postings, as well as photographs, videos, and various gifting schemes to woo Facebook friends. Use app-sharing features to tweet or post to Facebook. In both iOS 6 and iOS 7, more integration of Facebook and Twitter came to iPad. 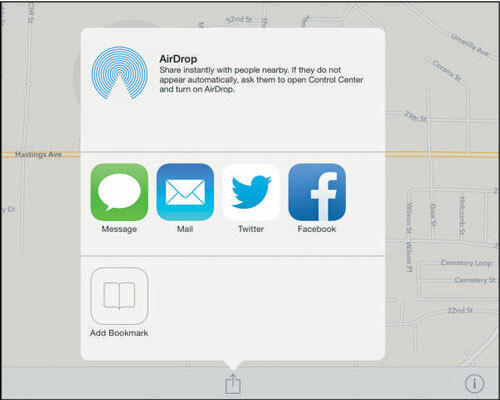 When you’re in an app such as Maps and you tap the Share button, you can post an item, such as a map, to your page. This integration is shown in the next task. Tap Settings and then tap Facebook. In the resulting settings (see this figure), tap the Install button to install the app. Enter your Facebook username and password, and then tap Sign In. On the confirming screen, tap the Sign In button. 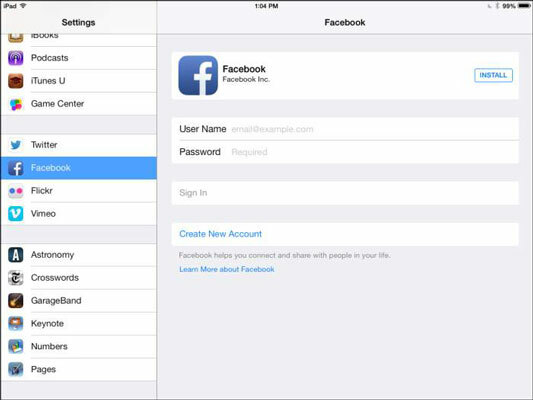 Note that signing into Facebook downloads all Facebook friends to your Contacts app and downloads any Facebook events to your Calendar app on iPad. You can turn off individual apps that use your Facebook account one by one in the main Facebook settings.